Droom Credit is India’s most comprehensive, unbiased and independent way to get instant loans. For most of us, searching for a financing option and applying for a loan is cumbersome process. We sometimes let go our dreams fearing the hassle of applying for the loan, rotation of file from one desk to another, and long approval process, Droom Credit aims to make loan process easier, instant and paperless. A service by Droom, Droom Credit offers 21st century-style smart financing options so that you can dream big and we can make it real. With our data driven, transparent, and scientific approach we help buyers get instant loan approvals through a paperless process. Droom Credit uses advance algorithms to ensure data security and quick & best financing options. Which banks have you partnered with? We have partnered with multiple banks and NBFCs to bring you the best set of products. Depending on your profile, we will select the bank that has the highest chance of approving your application. Once approved, banks eligible for your profile, will be shown to you. At Droom Credit, we understand your concern for the security of your personal and business details. We use SSL and other industry standard encryption technologies while exchanging sensitive data with the application and with banking partners. Our systems have been designed such that most of the steps are automated. We are legally compliant with all data privacy and IT security norms in India. Are financing options pre-decided or consumer can choose the bank or NBFC? Droom Credit has partnered with multiple banks and NBFCs to bring you the best set of products. Depending on your profile, we will select the bank(s) that has the highest chance of approving your application. Once approved, banks eligible for your profile, will be shown to you. You can choose the one from the given list. How do I register on Droom Credit? Simply signup from the side menu or register from home page as a borrower by filling in just a few details. How do I apply for loan on Droom Credit? Is it simple? Step 1: Let’s start – Fill in your basic details and register quickly With simple and secure registration process, just enter your basic details and you are ready to apply for the loan. Isn’t it simple! Step 2: Congratulations you are eligible for loan Yeah! That’s right, based on credit profile and details entered, we check your loan eligibility in real time. Our advance algorithms securely process the data provided by you. We are laser-fast! Step 3: It’s Paperless – Simply upload required documents for loan disbursal Let’s go green. No more compilation of files and hard copy of other documents Simply upload your documents and you are done. It’s is as simple as 1.2.3..! Step 4: Instant loan approvals – Check EMI’s payable and choose from the list of lenders Scroll to check the most preferred lender for you. We have listed various lenders with all the details. You can also check your EMI payable for the loan. Step 5: Wow! Your loan application is processed – We are fast! After you choose the lender, we send your pre-approved loan application to the lender for disbursal of the money. Just wait for a few days get your loan amount. Step 6: Go get your dream! – Hurray! It’s done! The seller will start receiving money directly from the lender. Once my loan is approved through Droom Credit, can my application be rejected later? Droom Credit uses advance technology and complex algorithms along with our financing partners (banks/NFBs) to do a series of checks on your application before the funds are available to you. If at any stage the information provided by you or the verification(s) initiated by us are found to be incomplete, fraudulent or unverifiable then your application will be terminated at the discretion of the financial institution you choose (Bank/NBFC). In this scenario, your approved loan application will be sent to the corresponding lending partner after paying a minimal and non-refundable processing fee, for final checks, if any, and for loan disbursal. So, please provide us the correct information at the onset! Do I have to pay interest? Is it high? You have to pay interest as per the bank's terms and conditions, which can be anywhere between 1 year to years. The repayment tenure you choose will determine your EMIs. The interest rate is equivalent to market rates for any ‘personal loan/auto loan’ with zero collateral or security. It can be as low as 1.25% per month depending on the partner bank and the credit profile of the user. Is there a processing fee? How can I pay for the processing fee? Yes, there is a nominal processing fee. We offer easy payment mode to our customers. You can pay the processing fee amount through Droom Credit using internet banking or any payment e-wallet. Your account will display the amount you owe. Can I use Droom Credit for any other purpose? Droom Credit offers easy financing and loans options, which can be used to meet your money/financial requirements while buying a vehicle, house or more. What happens if I don’t pay back? The same consequences apply as of not paying your bank loans. The Reserve Bank of India has nominated 4 credit agencies (e.g. CIBIL) to track your financial credit scores. If you do not repay or delay your repayment, our partner bank will automatically report it to these agencies, which will record the information. This can lower your credit score. Once your credit score is affected, all your future loan applications will be negatively impacted. You might not be able to get loans easily to buy a house, a car or a two-wheeler or get a credit-card, as all the lending institutions in the country check with these agencies before approving your loan. The bank might also initiate legal recourse to recover the money from you. How is the loan amount decided? Our Financial Partner decides the loan amount based on your profile, income, credit history and other factors. The amount you apply for can be increased or decreased based on the bank's credit policies and the details provided by you while filling the registration form. How do I know if my loan application is approved? Droom Credit instantly approves your loan, which is notified through a pop-up message. After that, we also send you a notification for the same on your registered email id and mobile number regarding the same. Whom should I contact for other queries? 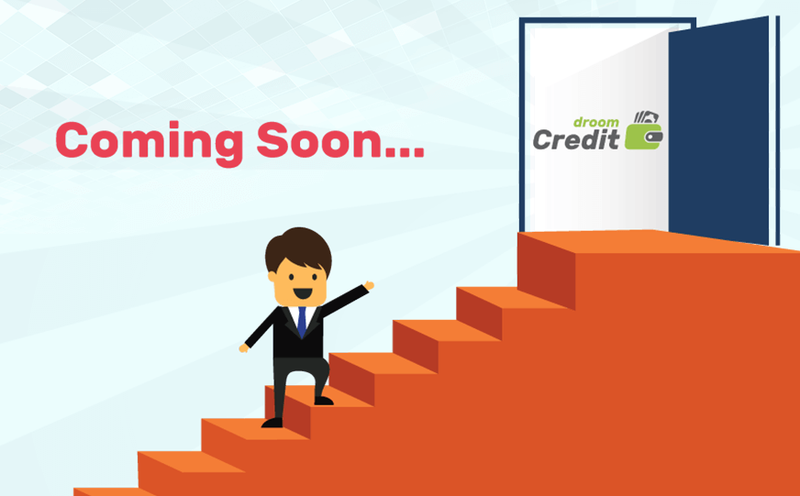 Please contact us at support@droomcredit.com for any queries. How long will it take for my loan to get approved? Droom Credit offers 21st century financing experience with its technologically advance platform wherein we provide instant loans through a paperless process. We will process your loan application and give a confirmation in 30 seconds regarding your loan process. Droom Credits works in a fast-paperless environment and we normally process your loan application in 30 seconds and a few hours for the bank/NBFC to finally verify your documents, if needed. After that it depends on bank how long it takes to transfer the money directly to the seller/merchant. How do we register on Droom Credit? Simply signup from the side menu or register from home page as a lender by filling in just a few contact details. Are there other financial institutions that will be onboarded? Yes, we will partner with multiple banks/NBFCs to bring the best set of offerings for our users. Depending on the borrowers’ profile and the eligibility criteria of various financial institutions, we will provide borrowers with the list of options from which he/she can select the best as per the requirements, depending on the rate of interest, tenure and other details. What are the benefits we will receive from Droom Credit? Is there any technical integration required for adopting Droom Credit? Yes, there will be technical integrations of our platform with yours. We will provide you technical API document for integrating with your platform with ours to give user a seamless experience. Our team of product and technical experts will be in touch with you throughout the process. Can we set the criteria for approvals of the loan? Droom Credit is self-service platform, which will allow you to fully manage your eligibility criteria and thresholds in secured manner. We give you a complete flexibility to establish and maintain your criteria for approvals at your own discretion. It is our top most priority that your eligibility criteria and loan process remains secure. It cannot be shared or seen by anyone, accept you. We are legally compliant with all data privacy and IT security norms in India. Is it possible to change the terms of loan, in case of change in our policies? Yes, you can change the terms of loans, in case of change in your policies whenever required. Will you provide training for using your platform? Droom Credit is a user-friendly and self-service platform; however, we will provide appropriate product training required to adopt the platform. We will also provide easy to use tutorials for better understanding of the product. How can we access the details of the borrower? We will send you the complete details of the borrower including all the valid documents through API integration between our platforms. What security measures do you employ? We use SSL and other industry standard encryption technologies while exchanging sensitive data with the application and with banking partners. Our systems have been designed such that most of the steps are automated. We are legally compliant with all data privacy and IT security norms in India. Will Droom Credit bear the liability in case of payment defaults by the borrower? No, Droom Credit works as an enabler for the borrowers to get easy access to the best loan offerings based on the eligibility criteria. The liability in case of payment default will be of the respective lender. Simply signup from the side menu or register from home page as a partner by filling in just a few contact details. We will keep in touch and notify you as soon as we are live. We have partnered with multiple banks and NBFCs to bring you the best set of products. Depending on your profile, we will select the bank that has the highest chance of approving your application. Once approved, your bank will be shown to you. Get more business - Droom Credit will help you drastically increase your sales and traffic. We offer instant loan approval for all your customers. Easy financing for their buyers - No more files and running around table to table for loan approvals, Droom Credit offers instant loan approvals with a completely paperless process. Simple technical integration - Our easy to use widget can be easily integrated on your platform, offering best user experience. Are there any specific technical requirements for integrating with Droom Credit? Yes, there will be technical integrations of our platform with yours. We will provide you technical API document for integrating with your platform with ours to give user a seamless experience, while purchasing a product from your website and applying for loan through us. Our team of product and technical experts will be in touch with you throughout the process. How can I place the request for integrating Droom Credit? It is easy to place the request for integrating Droom Credit. You can register on the Droom Credit website as partner and fill up the form with your business details and we will intimate as soon as we are up and running. You can also contact us directly through email or call. How my users will be benefited from Droom Credit? VIP Service Guarantee - Applying for a loan is incredibly easy with Droom Credit and you get VIP service guaranteed. We help you get instant loan approvals without any physical documentation. You can apply for a loan 24x7 without worrying about the brick and mortar bank timings. Customized Repayment Schedule – we offer easy repayment options, wherein you can plan your EMI schedule as per convenience. Your details & digital documents are secured with us – We understand your concern for security and privacy. We ensure to keep your personal details and digital documents safe and secure. Droom Credit has your back – Dreaming big! Droom Credit has got you covered with instant loan approvals that saves your time and mental stress. Instant end to end online loan approval – Everything is on the cloud. We process your loan request within minutes, so you don’t have to wait to get your dream. Moreover, we operate in a completely paperless environment, you just need to upload your digital documents and we are done.